The Breckwell P2700 has been around since 1999, the year after the P2000 was introduced. It's a smaller stove than the P 2000, giving out 45,000 btu. along with a burn time of 50 hours on the low setting. Longer if the optional thermostat is used to allow the stove to switch on and off. It's a bay window type stove which does allow a nice view of the burn, but like the P2000, really needs the optional brick fireback and the logset to avoid looking bare. The P2700 has a large ash pan for a stove of this size, it is recommended to be emptied only after burning a ton of fuel. See comments below. Window Size 17 in. by 9.5 in. Rear Vent Height 12.5 in. It's recommended that the Breckwell P2700 not be run for more than one or two hours at a time on the high heat setting to prevent damage. Ashes must be brushed or scraped into the ashpan. They don't drop automatically. 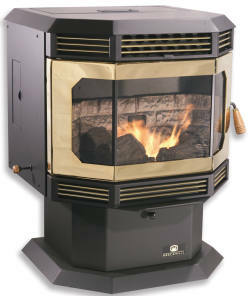 If you would like to leave a review of the Breckwell P2700 pellet stove, please use the form on the contact page.